On Mother’s Day 50 years ago, thousands converged on Washington, D.C., to take up the cause that Rev. Dr. Martin Luther King Jr. had been fighting for when he was assassinated on April 4, 1968: the Poor People’s Campaign. A little more than a week after her husband’s memorial service, Coretta Scott King led a march to demand an Economic Bill of Rights that included a guaranteed basic income, full employment and more low-income housing. Half a century later, Rev. Dr. William Barber II and Rev. Dr. Liz Theoharis have launched a new Poor People’s Campaign. Starting today, low-wage workers, clergy and community activists in 40 states are participating in actions and events across the country that will culminate in a mass protest in Washington, D.C., on June 23. We speak with Rev. Dr. William Barber and Rev. Dr. Liz Theoharis, co-chairs of the Poor People’s Campaign: A National Call for Moral Revival. . .
AMY GOODMAN: The new Poor People’s Campaign officially launched last year, and, since then, Reverend Dr. William Barber and Reverend Dr. Liz Theoharis have been touring the country. Today they’re in Washington, D.C., for a major day of nonviolent direct action, joining us now. We welcome you both to Democracy Now! 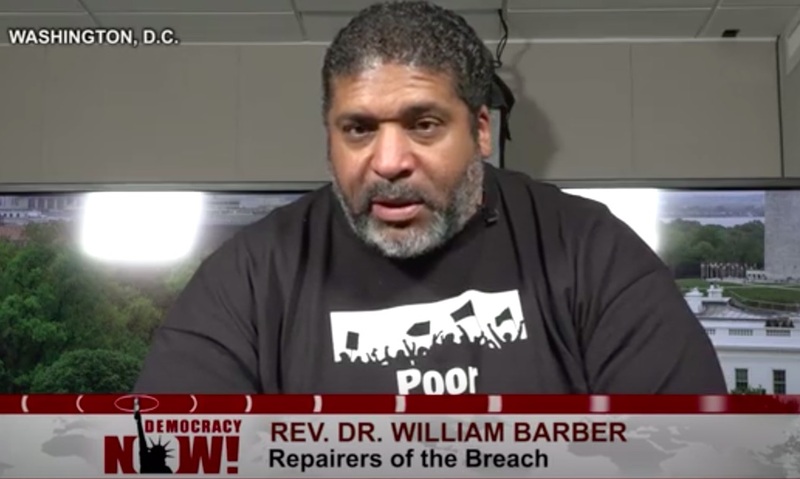 Reverend Dr. William Barber, you’re president of Repairers of the Breach, distinguished visiting professor of public theology at Union Theological Seminary, former president of the North Carolina NAACP, and Moral Mondays leader. Talk about what you’re doing now. What is different today? What are you doing in Washington, D.C.? REV. WILLIAM BARBER II: Thank you so much, Amy. Today, in more than 30 states and here in the District of Columbia, activists, clergy and, most of all, impacted people, the poor, will be organizing a nonviolent, moral, fusion direct action Mondays, a direct confrontation with what we call policy violence and the immoral policies that we see are continuing to hurt the poor. And particularly the focus today will be on women in poverty, children in poverty and the disabled. We cannot continue to have a democracy that engages in the kind of policy violence that we see happening every day. I think about the low-wage worker I met in North Carolina who could not get insurance, because North Carolina did not expand Medicaid, and was also sick with ovarian cancer and has children. Or Amy in West Virginia, who is a woman who’s a working poor woman, who watched her state, her governor, Republican governor, cynically give a little raise to teachers, but chose to do it by cutting Medicaid and cutting food stamps. Or I think about the lady Pamela in Lowndes County, Alabama, who has raw sewage in the back of her yard, who was taken advantage of by predatory lenders and had to pay over $100,000-some for a single wide trailer that is now falling apart, full of mold and holes. And her son, who is an 11-year-old, now has to wear a CPAP machine because of the infections in his lungs. And she, herself, is disabled. Helping the poorest of the poor help themselves, if millions took it up, could it be the foundation of a just world? All over this country, we continue to see what is not often seen or talked about in our politics, in our political debates, or even in the media, except for places like here, Amy. Two hundred fifty thousand people are dying every year from poverty and low wealth. Sixty-four million people work with less than a living wage, 54 percent of African Americans. And these realities hurt children and women and the disabled the most. Thousands of people who are homeless, of every different race, creed, color and sexual orientation. And what we are saying, it is time for a moral confrontation, a nonviolent moral confrontation, because whether you look at the morality of our Constitution, the establishment of justice, or you look at the morality of the Scriptures, that says, for instance, in Isaiah 10, “Woe unto those who legislate evil and rob the poor of their right and make women and children their prey.” It is immoral to have 37 million people without healthcare. It is immoral not to pay living wages when we know we can do it. It is immoral that people don’t have single-payer healthcare for everybody as a matter of human rights—and children have access to public education and college, and that we stop the trend of resegregation. It is immoral the way we’ve suppressed the vote in a way that allows people to get elected who, once they get elected, using racialized methods to do so, they then vote policies that hurt women and children and disabled. They’re against living wages. They’re against healthcare. They’re against unemployment—and those things that hurt families, hurt children, hurt women and hurt the disabled. And we’re coming together, of every race, creed, color, kind, people from every part of this country. There will be simultaneous nonviolent actions, beginning today with a 2:00 rally and then 3:00 direct action. And this will go on for 40 days, every Monday, along with other things that will be happening across the country. AMY GOODMAN: What is that direct action, Reverend Dr. Barber? REV. WILLIAM BARBER II: The direct action, well, today, after the rally, we will link arms, clergy, in full vestment, with impacted people. And today, we will—under the theme “Somebody is hurting our people, and it’s gone on far too long, and we can’t be silent anymore,” we will take a particular street, right near the east side of the Capitol, and we will engage in that street. Many people will sit down to pray and lay, because we are saying that the country is headed in the wrong direction. That’s why today it’s the street. Later on, it will be other places in D.C. But today it’s the street, because we’re saying the country is headed in the wrong direction. We have to break through the moral narrative. Our first goal is to break through the moral narrative to where we’re talking about it. We’re not even talking about these issues in the country. And we’re also going to be calling people to engage in massive voter mobilization. We’re also going to be doing power building among poor communities. And this, Amy, is a launch. The 40 days is not the end of the campaign. It is the launching of a multiyear campaign.